Launchers Guide for Android Get the best Launcher for your android phone! Zeam, thanks to its minimal aesthetic, not only looks fast but feels fast. It's also incredibly simple to use, and unlike the other launchers it actually works very well out of the box. My favorite feature in Zeam is configurable gestures -- but not only can you bind swipe actions, like ADW, but you can also bind double tapping the screen and the Home hardware button to actions. Create a widget poping up when tap a shortcut. Support formatted text for current date & time, missed calls and unread SMS/MMS messages. 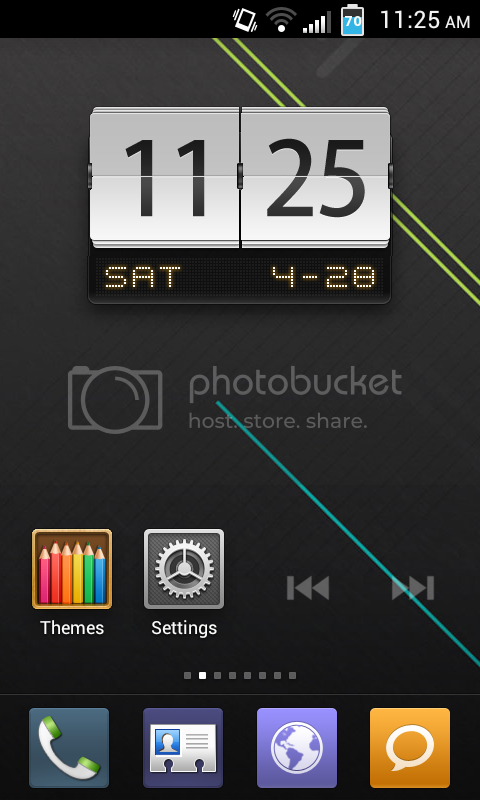 You can implement nice screen without launcher 7, dvr, minimalistic text, wp clock, clockr etc. Original Windows Phone 7 backgrounds! CC 3D Launcher is a fashion, funny, cool "home replacement" app. It maximizes your user experience on your Android phone, with the newest Android 4.0 feeling. 8000+ Themes, Wallpapers and Ringtones available! Works on all NON-MIUI ICS 4.0 based devices. Has native support for ICS. They also added homescreen looping and horizontal app drawer. Unveil the Dockbar flicking-up the app-drawer button and drop UNLIMITED shortcuts/folders! Lose the fat, keep the muscle. Be warned, Lightning Launcher is on steroïds. Lightning Launcher: Lose the fat, keep the muscle. Be warned, this launcher is on steroïds. Use "LLW App Widget" if you want to add Android widgets. This app is started through the HOME key and not from your app drawer since LL is itself a launcher. If you cannot select it through the HOME key then you need to clear the defaults for your current launcher. This application has been designed to minimize memory usage and be fast: the more memory you have for your applications, the faster they will run. In other words Lightning Launcher has been built from the ground to preserve your phone's resources and keep it smooth. In spite of its ridiculously small size (less than 60kb! ), Lightning Launcher is packed with a fair amount of features and brings to Android a very unique concept: the home screen can be seen as a giant surface on which you are free to put icons, shortcuts or widgets exactly where YOU WANT, and not limited to a 4x4 grid. Pinch to zoom in or out the desktop, use the home key to switch between a full scale view or the normal size, or double tap on empty space as in the web browser to immediately see all your icons. And everything stay functional whatever the zoom level is: widgets are alive, icons can be clicked, and so on. Lightning Launcher drops rarely used features and focuses on useful ones but comes nevertheless with numerous customization options. Icons and widgets can be moved, scaled and even rotated freely. Each object can be configured independently, you can change the font, the label, the icon and much more ! The package is extremely small, only a few kilobytes. What it means is that the Android system do not need to load several megabytes to run this app. Lightning Launcher starts faster and run in perfect harmony with your other apps. For people kindly asking why the CALL_PHONE permission is needed (notice that this the only one needed by LL! ): this is needed for direct call shortcuts, and this permission is included in all major launchers, including Go and Pro. For other people not asking why and putting stupid one star comments: go away, you have just lost a unique chance to try something new and better, have a good day. DXHome, a highly customized launcher replacement app., is a perfect launcher for Android phones. It is created by the Dianxinos Enterpriser team in Innovation Works invested by Dr. Kaifu Lee. Highly customizable with various themes, colorful desktop transitions, easy operating……, just like its name in Chinese, Dianxin is making the home of your Android phone colorful and enjoyable! What could you get from DXHome? So many themes to enjoy! Want your phone to change with your mood?! Try themes we designed for you! DXHome presents its first six themes of totally different styles! NO.2 Midsummer Theme--- get fidgety from the hate outside? Pick some cool and fresh air here! NO.4 Batman— a big Batman fan? Here he comes! COOL! NO.5 Clothing— want your phone to be cute? DXHome makes suit for your icon! Try it on! NO.6 Tree & Shadow— at the end, come and sit down beside the tree, just enjoy the peaceful nightfall now. 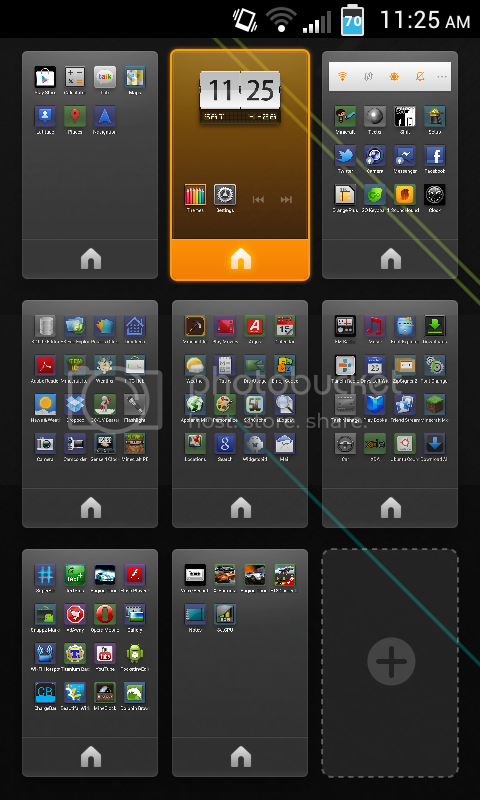 Espier Launcher is a desktop for your smartphone or tablet which is based on Android 2.2 or later. It brings you an entirely new interaction experience, and makes your smartphone and/or tablet to be different from the rest. Balancer Launcher is a Home(Launcher) app, like ADWLauncher,LauncherPro,Go Launcher,Launcher7,Zeam,Regina Launcher etc, which is focused on provide users a brief and useful Home. The Launcher has smooth ui effect and perfect performance, it can launch application quickly. Be compared with some other similar applications, It has better performance and do cut off some useless settings, we think a simple and cool application is what a user wanted exactly and we will try our best to create one for you. Make no mistake, this is the fastest launcher you'll ever run. Small, light, configurable. The Gingerbread launcher as it should have been. No useless stuff, no compromises. Performance and usability are the driving forces here. On version 3.0 Pro users have a all new game to play now: The Pro version can use existing ADW, Go Launcher and LauncherPro Icon and Dock themes, giving FTL and unprecedented array of possible theming. You can even mix Dock and Icon themes from different launchers. Google Play is yours for the take. And of course you still have the other extras: configurable homsecreen grid from 4x4 to 6x6, resizeable widgets, and, never seen in any launcher: control over core Android window animation speed. Important: FTL supports all resolutions and ICS, but only 800x480, 854x480, 960x540 and 480x320 devices have 3D drawer enabled! Also ICS has no 3D drawer because it does not contain the "old" opengl interface. But as it is natively accelerated anyway, 2D drawer should be very fast. Theming support: The Pro version can use existing ADW, Go Launcher and Launcher Pro Icon and Dock themes, giving FTL and unprecedented array of possible theming. Quickly set up Home Screens, Widgets, App Trays, and Wallpapers all with a few gestures.